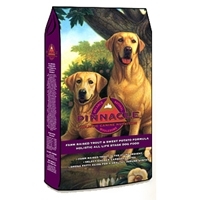 Pinnacle Trout & Sweet Potato - Dog 15 lb. It sounds like an entrée at a fine restaurant, fresh trout and delicious sweet potatoes. But these are also a fine and delicious source of nutrition that makes Pinnacle an excellent choice for active puppies and adult dogs.